Founded in 1917, Omaha Steaks sells gourmet food, including poultry, pork, seafood, appetizers, side dishes and desserts. The foods are shipped frozen to your home, or you can purchase them from one of the 85 retail locations. The stuffed baked potatoes are filled with whipped potatoes mixed with sour cream, bacon bits, chives and cheddar cheese. The potatoes need to be heated properly -- by oven, grill or microwave -- before you can serve them. Open the package to remove the stuffed potato. Place the frozen stuffed potato on a baking sheet. Bake the stuffed potato for 40 minutes or until lightly browned. Remove the potato from the oven. Heat the grill on medium-high heat. If you are using a charcoal grill, allow the charcoal to burn down until a white ash develops. Remove the stuffed potato from the packaging. Place the potato on the center of a sheet of aluminum foil. Wrap the aluminum foil around the bottom portion of the stuffed potato. Leave the top half of the potato exposed. Close the lid on the grill. Cook the stuffed potato for 35 to 45 minutes. Remove the stuffed potato from the plastic packaging. Place the frozen potato on a microwave-safe dish. Cook one potato on high for 2 1/2 to 4 minutes. Rotate the potato halfway through the cooking time if your microwave does not have a rotating plate. 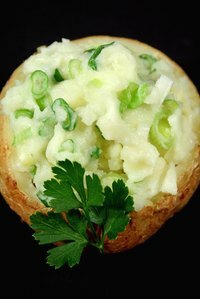 Remove the stuffed baked potato from the microwave when the center is tender and hot. Add your favorite seasonings, such as salt, pepper or butter, to the potato after you heat it thoroughly. Avoid overcooking the potato because it will become hard and unpleasant to eat.